I moved to Central Washington in 2002 from Gig Harbor, Washington. I studied marketing and public relations at Central Washington University and obtained my Bachelor of Arts of 2006. The next eight years were dedicated to developing my skills in marketing and sales placing emphasis on client satisfaction and creative sales in both retail and outside sales environments. I love the real estate industry and my high energy, thoroughness, integrity and dedication help to bring success. I am a member of the Yakima Association of Realtors as well as the National Association of Realtors. 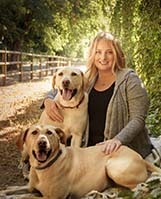 When I am not busy bringing together clients and their perfect fit home, I am spending time with my two yellow lab “fur kids” and my husband enjoying our local community. Yakima has drawn me in with its beautiful hiking trails, diverse seasons, and world-class wineries. Growing up in Gig Harbor, I was exposed at an early age and continue to enjoy scuba diving, fishing, boating and snorkeling. I am excited any time I can get to a new place to explore whether it’s local or far away. I thrive on challenge, adaptation and creative solutions. If you are thinking of buying and/or selling a home, I would love the opportunity to work with you on this important fun adventure.